This post is sponsored by Old Fashioned Milk Paint Co. in the form of paints. Although this post is sponsored all the opinions are my own. I only promote product I believe in! Welcome to Our Crafty Mom! 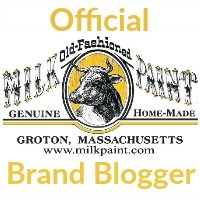 I am so happy to announce that I have been chosen to participate in the Old Fashioned Milk Paint Co.’s official Brand Bloggers and Ambassadors program! Yes, I am definitely doing a little happy dance! Today I get to reveal my first project completed with this paint and I am really happy to share it with you! If you’ve visited here before, you know how much I love to refinish furniture. 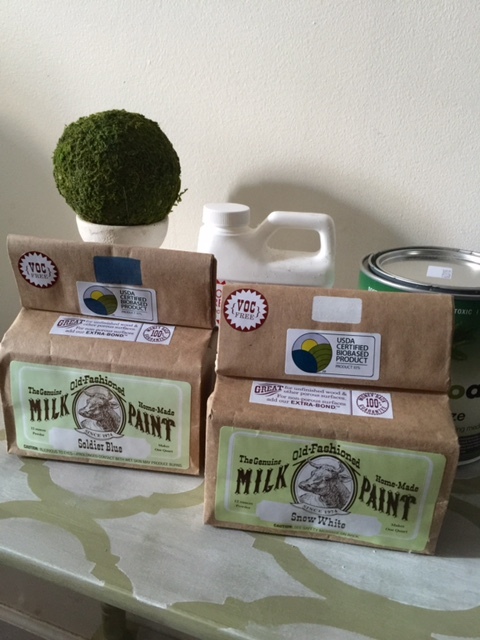 Old Fashioned Milk Paint Co. is the first original true milk paint on the market since 1974. I love the history of this company. I also love that it contains only ingredients that are all-natural and will not harm the environment, making it truly a “green paint”. Did I mention it also comes in 20 colors? But you can also mix colors and come up with so many more. I can’t wait to experiment with different colors and techniques using this paint! The OFMP is packaged in a dry powder form. You don’t need to use primer, just add water and mix to your desired amount of paint (a pint, quart or a gallon). 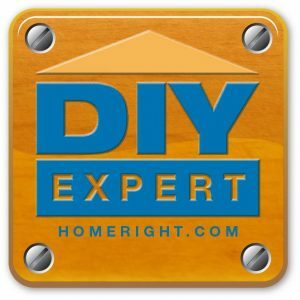 You control the type of paint you are mixing to obtain either a stain, full coverage paint or perhaps a stenciling project. For this project I decided to use soldier blue and snow white. Look how cool the packaging is! Love the little brown bags! I used a mason jar to mix the milk paint adding equal amounts of powder and water until it formed a nice consistency for full coverage. As I was using the milk paint on a previously finished, unsanded piece, I did add OFMP Extra-Bond to ensure that the paint adhered well. As with any piece of furniture, prep is so important. Not only ensure that you clean it properly, but also do the necessary prep work for the piece that you are working with. 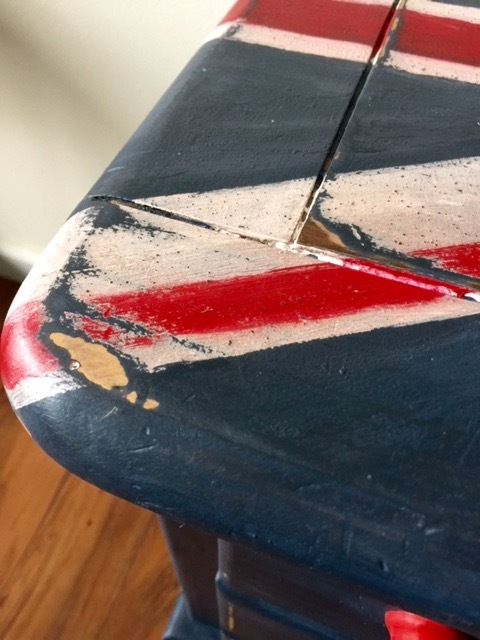 While OFMP does not require primer-the first coat acts as a primer-if you do not sand the piece it will chip as it dries. If you are going for that great chippy look we all love, then you are good to go. As I did not want this piece to be chippy, I added Extra Bond and it worked like a dream! As I know I will be mixing up a lot of different paint, I simply peeled off the label from the bag and adhered it to my mason jar so I know what colors I am working with. How gorgeous is this blue? I have a feeling this is going to be my new favorite blue. It is sort of a cross between a navy and a royal, but just perfect! I say it all the time, but seriously, what a difference paint can make! Check back soon for more OFMP projects, including this month’s Fab Furniture Flippin’ Contest! I hope to finish up that project this weekend. Thanks for visiting and have a great day! What a wonderful makeover Michelle! And I love love OFMP Soldier Blue! 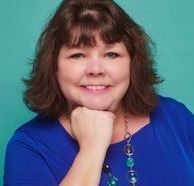 I just inquired about becoming an Ambassador – congratulations to you and best of luck!!!! I love how this turned out. The flag on top really makes it. And I agree with you, it is a nice blue. This turned out so cute and fun. I really love that distressed corner and the color. I don’t do many things in that color blue but I may have to start! Thanks. Your table is so cool!! 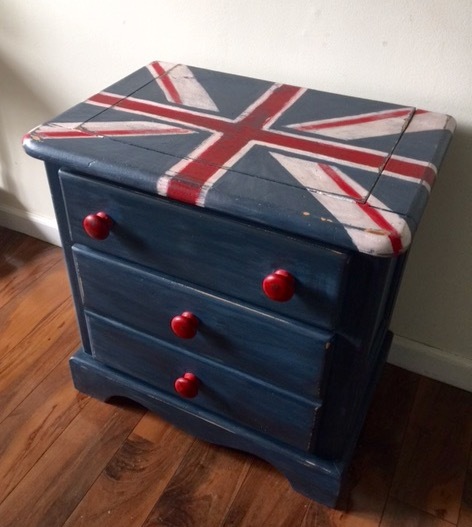 I love Union Jack and using it for the table top is great. I wasn’t sure about Soldier Blue but seeing it now I really like it. Good job! 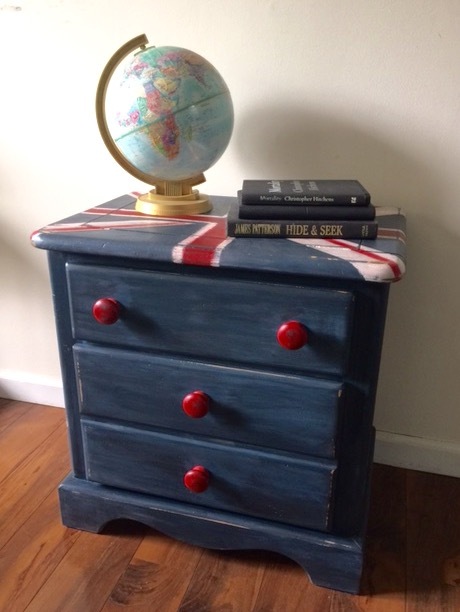 The night stand looks great, Michelle! 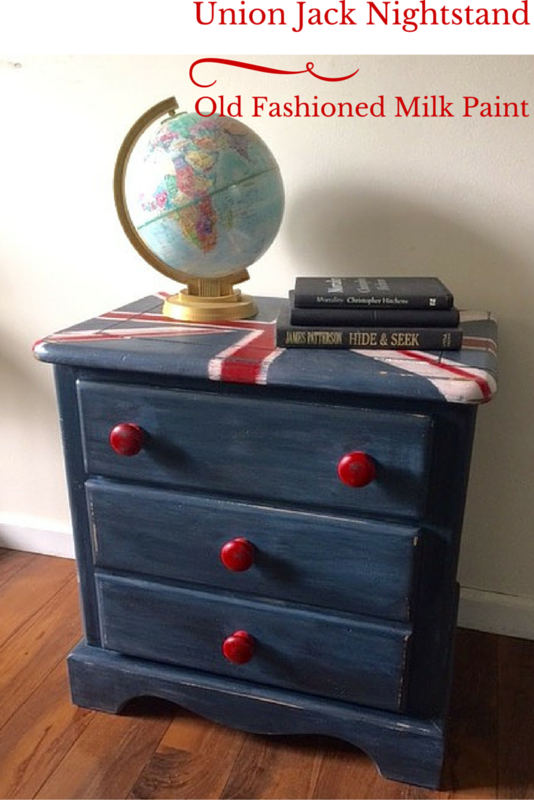 What a fun idea to paint the Union Jack on it. Pinning and Tweeting. Thanks for sharing at Snickerdoodle Sunday. Wow, what a beautiful transformation. I love the design and the colors are beautiful! I love that blue. Pinned and sharing! Oh the Union Jack has never looked sweeter! Thank you so much for joining the gathering at Thoughts of Home on Thursday. The before and after of this project is amazing! You are so talented! I love this nightstand! It’s gorgeous. Thanks so much for sharing at Merry Monday. This is a nice transformation. I like how simple it is to make too. 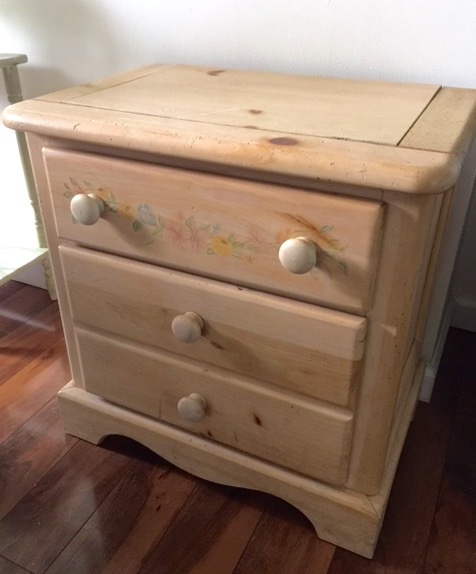 Hey Michelle, Just wanted to let you know your fabulous milk painted nightstand is being featured at tomorrow’s Vintage Charm party! Thanks for sharing it! 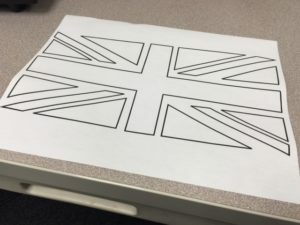 Great job on your union jack project, Michelle. The before and after is quite incredible. Take care.